수덕사 대웅전(국보 제49호)에 모셔져 있는 목조 삼세불좌상 및 복장유물과 연화대좌, 수미단 등이다. 삼세불좌상은 수덕사의 중흥조(中興祖)인 만공(滿空)선사가 전북 남원에 있는 만행산 ‘귀정사(歸淨寺)’로부터 옮겨온 것이라고 한다. 중앙의 석가모니불을 중심으로 오른쪽에는 약사불, 왼쪽에는 아미타불이 자리하고 있다. 석가모니불은 주존으로서 굽어보는 듯한 자세에 당당한 어깨와 넓은 무릎을 하여 안정되어 보인다. 육계의 구분이 불분명한 머리에는 중앙계주와 정상계주가 표현되어 있으며, 네모꼴의 각진 얼굴에는 근엄한 듯 부드러운 미소가 엿보인다. 귀는 길어서 어깨까지 늘어졌고, 가늘어진 목에는 세 개의 주름인 삼도(三道)가 뚜렷하다. 옷은 양어깨를 다 덮는 통견(通肩) 형식으로 오른팔이 드러나게 함으로써 17세기 불상들에서 나타나는 전형적인 양식적 특징을 보여주고 있다. 손 모양은 왼손을 무릎 위에 두고 오른손을 무릎 아래로 내려 항마촉지인(降魔觸地印)을 하고 있다. 약사불과 아미타불 또한 머리 모양, 얼굴 형태와 귀·눈·입·코의 표현, 양 손과 옷주름선의 사실적 묘사 등이 본존불과 동일한 양식적 특징을 보여주고 있다. 다만, 약사불이 왼손을 위로 하고 오른손을 아래로 하여 엄지와 중지를 맞댄 채 오른손 바닥에 약그릇을 들고 있는데 비해, 아미타불은 약사불과 손의 좌우가 바뀌고 약그릇이 보이지 않는 것만이 다를 뿐이다. 불상 안에서 발견된 ‘조성기’에 의하여 조선 인조 17년(1639)에 수연(守衍)비구를 비롯한 7명의 화원(畵員)들이 참여하였음을 알 수 있다. 한편, 석가모니불이 앉아 있는 대좌형 수미단(須彌壇)은 고려시대 심원사(心源寺) 대웅전 불탁(佛卓)과 그 장엄수법이 동일한 것으로, 금강저(金剛杵)·삽화병(揷花甁)·목단(牧丹)·운파(雲波) 등 안상(眼象) 조각에서 고려시대 불탁의 특징을 살필 수 있다. 이 수미단의 기초는 좌우 일반형 탁자와 달리 대웅전 마루 저면 약 30㎝ 지점의 초기 평면과 동일하며, 그곳에서부터 육각의 저대석이 탁자를 지탱하고 있는 것으로 보아 조성시기는 대웅전 건립연대(1308)와 같을 것으로 추정된다. 이와 함께 수미단은 유일하게 대좌형 수미단을 육각과 장방형으로 각기 구성하고 있어 공예사적으로 귀중한 자료가 된다. 불상 안에서 나온 복장유물은 전적류·후령통(喉鈴筒) 및 오색실·복식 등이 있다. 전적류는 발원문을 비롯하여 『묘법연화경』·『대방광원각수다라료의경』·『불설관세음경』 등의 경전과 진언문 및 다라니로서 17세기 초반에 간행된 목판본이 주를 이루고 있다. 후령통 안에는 각각 오방(五方)을 상징하는 5색의 사각형 직물 안에 원형, 금강저, 삼족(三足)과 육족(六足)의 번(幡)을 의미하는 형태의 직물이 들어 있었다. 오색실은 동·서·남·북·중앙을 상징하는 청색·흰색·홍색·자주색·황색의 실이다. 복식은 조선 중기 포(袍)에서 두루마기의 형태를 따르고 있으며 모든 직물의 색상이 완벽하게 보존되어 있어서 조선 중기 직물사 및 염색에 관한 연구에 귀중한 자료로 평가된다. 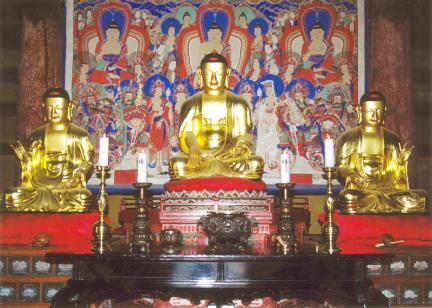 The Buddha triad kept at the Main Hall (National Treasure no. 49) of Sudeoksa Temple is said to have been taken to its current location by Monk Mangong, who played a leading role in the revival of Sudeoksa, from Gwijeongsa Temple in Manhaengsan, Namwon. The image of Shakyamuni Buddha is at the center, flanked by that of the Medicine Buddha and Amitabha Buddha. The image of Shakyamuni Buddha assumes a stance of looking down from a high position. He has imposing shoulders and looks stable with widely placed laps. Beads are displayed on top of the head and near the forehead. The square face wears a benevolent smile, with the long ears almost reaching the shoulders. The thin neck has three lines. The robe is hung on both shoulders, and the right arm is revealed under the robe as a typical style displayed by Buddha images made in the early 17th Century. The fingers of one hand point to the bottom, with the other hand placed on the lap, palm facing up (gesture of subjugating demons). The images of the Medicine Buddha and Amitabha Buddha are similar to the image of the Lord Buddha in terms of the head, the facial features, and the realistically depicted hands and robe wrinkles, etc. The Medicine Buddha holds up his left hand, with the right hand -- which is holding a medicine bowl -- held down. The Amitabha Buddha’s hands do the reverse of what the Medicine Buddha’s hands do minus the medicine bowl. 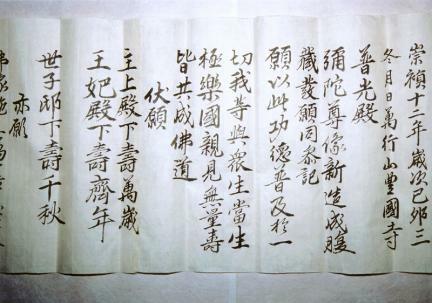 The relevant records found from the inside of the images say that the images were made by seven monk artists, including Suyeon, in 1639 (the 17th year of King Injo’s reign). 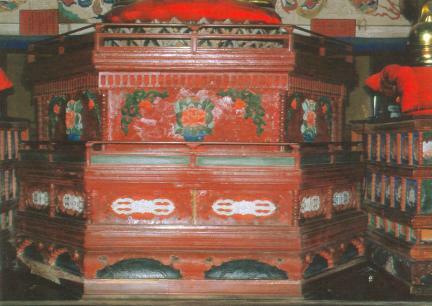 Shumidan Altar on which Shakyamuni Buddha sits has a similarity to the table in the Main Hall, Simwonsa dating back to the Goryeo Period (918-1392) in terms of decoration techniques. Decorative carvings of vajra, flower vase, peony, cloud waves, etc., show features of the Buddhist table of the Goryeo period. The altar is presumed to have been made simultaneously with the Main Hall where it is placed in 1308. The altar is regarded as an interesting material for those studying the history of handicrafts due to its use of rectangular and hexagonal shapes. Relics found from the Buddha images include printed materials, huryeongtong (container containing gems, grains, incense, medicinal herbs, etc., attached to a Buddha image or painting), five-colored thread, and robe accessories. Printed materials include: written prayer, copy of Lotus Sutra, Dharani sutra in gold on indigo paper, Avalokiteshvara Sutra, and Dharani Sutra (woodblock edition printed in the early 17th Century). 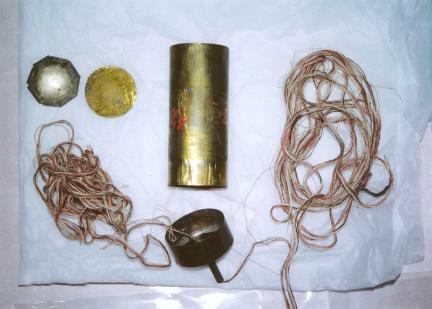 Items kept in huryeongtong have been preserved well and are consequently precious materials for those studying the textiles and dyeing of the mid- Joseon Period (1392-1910).